We’re big fans of Evernote around here. But we’re also big fans of old school tools that still work. In fact, we may be missing out on some big benefits if we continue not using real paper for sermon preparation. Whether you’ve made the move to all digital or you’re still using real paper in your sermon preparation, these benefits are worth knowing. For my digital only friends, you may just find that real paper is still worth being used. Evernote is tremendously useful for digital note taking, audio recording, organization, and document storage, but there’s another thing it offers that many of us probably don’t take advantage of. What is it? The Evernote camera allows you to take your physical notebook pages and turn them into searchable, digital documents. That’s right, you can take notes in a notebook, pull your phone out, take a picture of the page, tag it, title it, and then later search what you wrote and Evernote will find it. So, for anyone who is hesitant to use real paper because of the organization and storage advantages of digital, they can rest assured. Evernote brings you the ability to do the same for your real paper notes. And did you know? Moleskine makes notebooks that are specifically for Evernote. Check out the video below to see how to use this Evernote feature (spoiler: you don’t need a fancy notebook for this). Studies have shown that using real paper helps us learn more than if we only use digital note taking methods. In fact, using real paper and handwriting your sermon preparation activates the reticular activating system in the brain which helps you recall what you are focusing on. What this means is that using real paper will help you digest your sermon preparation so that when it comes to writing your message and presenting it, you’ll know it more deeply than if you did all your preparation work on your laptop. This one may be obvious once I say it but in our time of email, social media, text messages, and constant notifications, it couldn’t be more important. 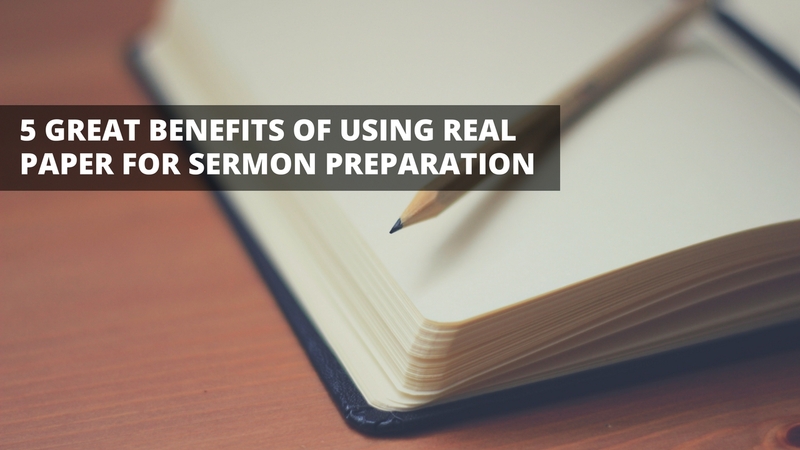 Using real paper for your sermon preparation helps you prevent distractions. What this means is that even if you are using Bible software like Logos, you can turn off your wifi and get focused on the Bible, some commentaries, and you can even still have access to Logos while you are offline. Let’s be honest, it’s easy to find a reason to become distracted away from sermon preparation. But using real paper will help you win the distraction battle. In addition, keep some sticky notes close by and write down whatever it is you feel that needs to be done in the middle of sermon preparation so you don’t forget to do it later. Then get back at it. Our world moves quickly and it’s easy to allow the fast pace of our culture to creep into our sermon preparation. And the thing is, we all know that when that happens, the result isn’t good. When we use real paper for sermon preparation, it causes us to slow down and think through, at a deeper level, the text, today’s context, and what God is doing in us in that moment. Pastor, we need to slow down more and using real paper will help us do this in sermon preparation. And I believe the result of a slowing down in our prep will be a greater sensitivity to how the Spirit of God is leading us to apply this for the church. I don’t know about you, but sometimes lines of text just don’t cut it. Instead, I need some free space to jot down ideas, maybe draw a diagram, and just get out of the more straightforward outline. Some pastors have utilized mind mapping for their sermon preparation and I think it’s a great idea. Jonathan K. Dodson wrote a good article on drawing your sermon. Here’s the point: sermon preparation can be a more expressive process than simply writing in straight lines. When we utilize real paper, we are opening the door to a different kind of sermon preparation. And let’s keep in mind that just like pastors learn in different ways (maybe you’re a visual learner and love to draw), your congregation also learns in different ways (maybe someone could greatly benefit from that drawing or diagram you created in your sermon preparation). Using real paper in sermon prep opens the door to 5 great benefits. These benefits are the reasons why I created the Sticky Sermons Notebook. It allows you to begin using real paper for your sermon preparation for an entire year. 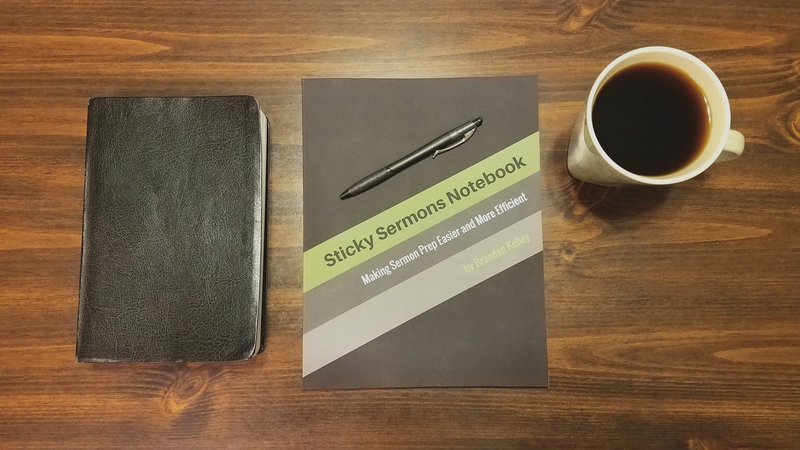 The Sticky Sermons Notebook has 4 features that will help you become more efficient at sermon preparation so you can do more ministry. Table of Contents that allows you to see every sermon for the year in one place. Customizable Notes Pages that allows you to lay out your prep notes in whatever form you prefer. You’ll fill in the Scripture(s), the sermon title, do your prep work, and then craft your big idea for the sermon. Sticky Sermons Framework Outline Pages that will ensure your message is structured in a way that is memorable because it will help you structure your message like a story. Sermon Series Planning Pages that will help you craft series that are intentional and impactful rather than series that are loosely connected and poorly planned. Make the jump and begin using real paper for sermon preparation and take advantage of these benefits. The Sticky Sermons Notebook is a great choice. Do You Use Real Paper for Sermon Preparation? We’d love to hear from you. How do you use real paper for sermon preparation? You can do so in the comments below or on social media: Join our Facebook Group, tweet us, or post on our Facebook Page. We would love to connect! The notebook links are affiliate links which means if you purchase a notebook through one of the above links, I’ll make a few pennies or so from it.